Last night the storm continued with the wind and the sea state picking up further. As a result, we are now playing a frustrating waiting game – and as you can see from the location we haven’t moved anywhere since yesterday lunch time. 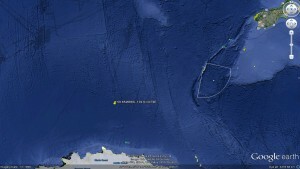 As we approach 60°S the air temperature is 3-4°C with the odd snow flurry, the water 3-4°C and the wind up at about 50 knots (about 90 km/hour). This makes it much less pleasant to be working out on deck, and it is only likely to get colder…. We had an excellent introduction to Antarctic survival by Brian Staite before departure, but it was time for some reminders about hypothermia, cold exposure, frostbite and cold immersion. Many on board are familiar with life “in the freezer”, but for the benefit of those new to the south the doctor gave a talk on cold exposure to crew and scientists today, reminding them about the dangers of hypothermia and what to look out for, particularly ‘the umbles’: fumbles, mumbles, stumbles and grumbles. All are warning signs that our bodies are not maintaining core temperature. 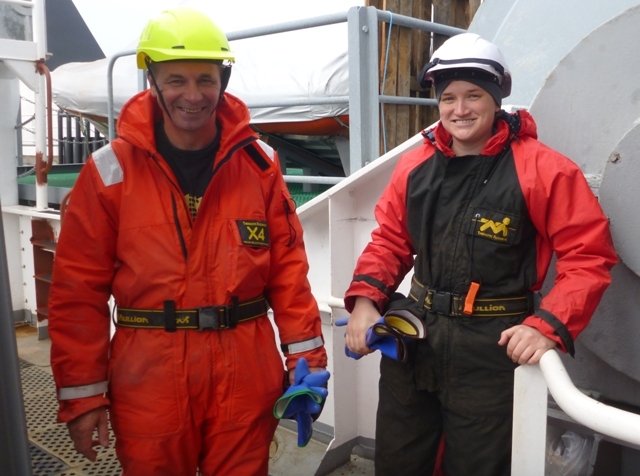 We have the ship’s excellent chefs, Kim and Kris, to thank for taking care of our first protective layer against the cold – a stomach full of food for energy. Our second layer, body fat, is more variable among those on board. I suspect the chefs are on a secret mission to increase it on everyone. The outer three layers are thermals, a fleece layer and finally a wind and waterproof layer to give us five layers of protection in this extreme environment. Thick socks, hats, neck warmers and gloves complete the picture. 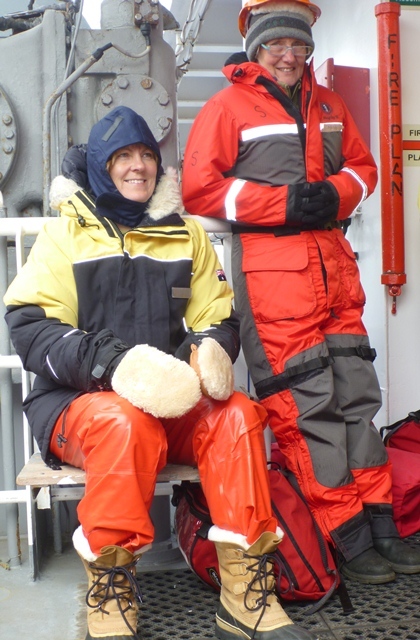 On the ship, most of the scientists and crew wear bright orange ‘Mullion’ suits on deck to stay warm and dry, and to provide emergency flotation. Keeping your hands warm is the most difficult thing to do, especially when you need to do fine work sampling very cold water. Photos of frostnip and more extreme frostbite had much more impact than words of advice. We certainly hope not to be in danger of either, but we will be a long way south and wind chill can be treacherous, so it is important to keep an eye on colleagues when out in the weather and watch for any developing areas of frostnip – especially on the fingers and faces. The donning of the immersion suits during one of our safety drills (while a very entertaining exercise) was another reminder of the importance of keeping warm and dry. 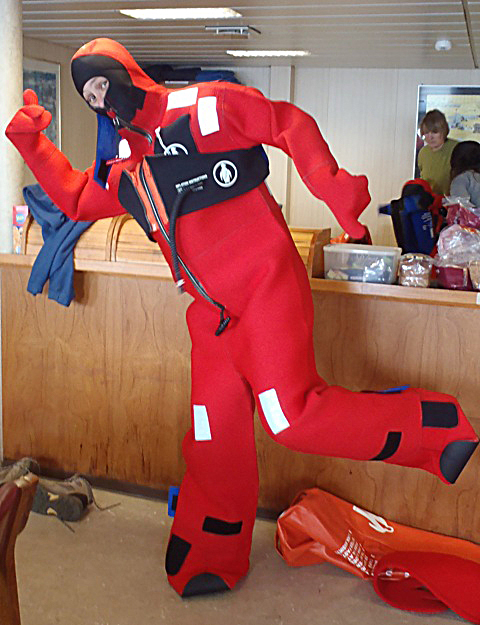 Glen, the ship’s ‘leading hand’, provided a speedy demonstration on how to do this, managing to get the immersion dry suit on in a quick 1 min 40 sec. Most of us took a lot longer and probably need to practise. An additional note: the ‘one size fits all’ suits are not especially helpful for those of us that are smaller or larger than normal.